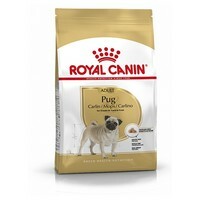 Royal Canin Pug Adult has been specially formulated to provide optimal support for the Pug breed's unique physiology. Made with high quality ingredients, this unique blend targets skin, muscle tone, weight and also helps maintain vitality in older Pugs. Suitable for adult and mature Pugs over 10 months old. My pug loves this food. Perfectly formulated for pugs. An essential for any pug!